The International Livestock Research Institute (ILRI) seeks to recruit Field Coordinator – Turkana to Coordinate field activities aimed at increasing pastoralist livestock productivity and market linkages (through increased access to inputs and services as well as uptake of productivity enhancing technologies), working closely with development partners and the Turkana county government ministry/department. · Coordinate field activities aimed at increasing pastoralist livestock productivity and market linkages (through increased access to inputs and services as well as uptake of productivity enhancing technologies), working closely with development partners and the Turkana county government ministry/department. · Establish and manage stakeholder relationships that improve the ability of the team to achieve the agreed outputs and outcomes. · Ensure timely and appropriate implementation of project activities. · Support project monitoring activities. · Master’s degree in Veterinary, Livestock Production, Animal Health, Development Studies, Project Management or Rangeland Ecology/ Management with experience in implementing development projects OR a bachelor’s degree with a minimum of 5 years’ experience implementing development projects. · Field experience in implementation of livestock development projects in the Kenyan ASALs – especially in the area of livestock husbandry, animal health, livestock production and farmer/pastoralists’ market linkages. · Demonstrated experience working in collaborative development projects involving multiple partners and including good understanding of both National and County Government programs and processes under the State Department of Livestock. · Demonstrated experience in coordination of field activities and supervision of field staff. · Proven experience in program management and monitoring & evaluation. · Good interpersonal, facilitation and communication skills especially to diverse audience and targets. · Ability to work in multi-cultural environment and foster teamwork. · Ability to work with limited supervision and to take initiatives. These are Nationally Recruited Staff (NRS) position; based at Turkana, Kenya and open to Kenyan nationals only. The position is on Fixed Term contract upto a period ending on 31st December 2020. This position is job level 2D, ILRI offers a competitive salary and benefits package which includes; pension, medical and other insurances for ILRI’s Nationally Recruited Staff. Applicants should send a cover letter and CV expressing their interest in the position, what they can bring to the job and the names and addresses (including telephone and email) of three referees who are knowledgeable about the candidate’s professional qualifications and work experience to the Director, People and Organizational Development by clicking on the “Apply Now” tab. The position title and reference number REF: AVCD/02/2019 should be clearly marked on the subject line of the cover letter. The International Livestock Research Institute (ILRI) seeks to recruit a Procurement Officer to support in procurement of goods and services. · Proactively coordinate the tendering process for both goods and services, ensuring that the process follows best practice and ILRI’ tender policies. · Carry out price surveys and maintain price list for routinely purchased items from preferred vendors and ensure prices charged by the suppliers are the market prices. · Ensure ILRI supply chain procedures are adhered to while purchasing goods/ services required by ILRI. · Ensuring all specifications in the purchase requisitions are captured in the requests for quotations and subsequently in the purchase order and that the delivered goods conform to the requesters specifications. · Work with the procurement committee as per ILRI Supply Chain Policy to source for suppliers who are not in the prequalification list. · Ensure the turnaround time for purchase requisitions is as per the shared Supply Chain service charter and in conformity with customer needs. · Assist in communicating changes in the supply chain policies to both Internal and external customers and responding to audit queries on time. · Liaise with the ILRI legal team to ensure compliance with all applicable laws and policies in the preparation of Service Contracts and Service Level Agreement (SLAs) and service contracts. · Assist in the drafting framework agreements and other related agreements for preferred suppliers. · Participate in preparing prequalification documents and appraising prequalified suppliers. · Coordinate vendor performance management review using the approved institutional tools and participate in decision making based on the evaluation. · Bachelors’ degree in Science or Laboratory technology or Purchasing& Supply Chain Management plus a post Graduate Diploma in Laboratory technology or any other relevant degree from a recognized University or an equivalent qualification. · Five years working experience in a busy procurement environment and at least 2 years in a busy Biosciences research program would be desirable. This is a Nationally Recruited Staff (NRS) position based at ILRI. It is open to Kenyan nationals only. The position is on a 3-year contract, renewable subject to satisfactory performance and availability of funding. This position is job level 2D ILRI offers a competitive salary and benefits package which includes; pension, medical and other insurances for ILRI’s Nationally Recruited Staff. Applicants should send a cover letter and CV expressing their interest in the position, what they can bring to the job and the names and addresses (including telephone and email) of three referees who are knowledgeable about the candidate’s professional qualifications and work experience to the Director, People and Organizational Development by clicking on the “Apply Now” tab above before 22 April 2019. 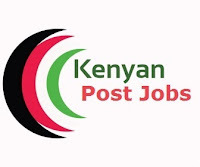 The position title and reference number REF: PO/CS/4/2019 should be clearly marked on the subject line of the cover letter.